Since 1966, there have been twelve Israelis who were awarded Nobel Prize, the most honorable award in various fields including chemistry, economics, literature and peace. Israelis are the citizens or permanent residents of the State of Israel, a multiethnic state populated by people of different ethnic backgrounds. The largest ethnic groups in Israel are Jews (75%), followed by Arabs (20%) and other minorities (5%). 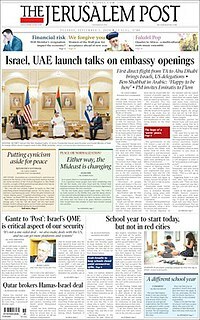 Among the Israeli Jewish population, hundreds of thousands of Jews born in Israel are descended from Ashkenazi Jew, Mizrahi Jews, Sephardi Jews and an array of groups from all the Jewish ethnic divisions, though over 50% of Israel’s Jewish population is of at least partial Mizrahi descent. 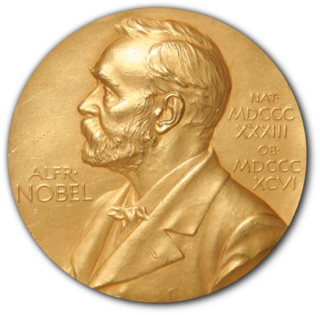 The following is a complete list of Israeli Nobel laureates. ↑ "Shmuel Agnon - Facts". nobelprize.org. Retrieved 25 March 2017. ↑ "Menachem Begin - Facts". nobelprize.org. Retrieved 25 March 2017. ↑ "The Nobel Peace Prize 1994". nobelprize.org. Retrieved 25 March 2017. ↑ "Daniel Kahneman - Facts". nobelprize.org. Retrieved 25 March 2017. ↑ "The Nobel Prize in Chemistry 2004". nobelprize.org. Retrieved 25 March 2017. ↑ "Robert J. Aumann - Facts". nobelprize.org. Retrieved 25 March 2017. ↑ "Ada E. Yonath - Facts". nobelprize.org. Retrieved 25 March 2017. ↑ "Dan Shechtman - Facts". nobelprize.org. Retrieved 25 March 2017. ↑ "The Nobel Prize in Chemistry 2013". nobelprize.org. Retrieved 25 March 2017. Wikimedia Commons has media related to Nobel laureates from Israel .